Will AI Revolutionize Space Exploration? There is a surge of interest in artificial intelligence (AI), which is my area of research, thanks to the recent victory of the Alpha GO algorithm over a human champion. Arguably the most famous AI in fictional universes, at least for space geeks like myself or movie lovers, would be HAL 9000 in 2001 Space Odyssey. The human-comparable machine intelligence was on-board Discovery on a Jupiter mission as the sixth crew member. It was a very memorable scene when HAL 9000 sang Daisy Bell as it was deactivated by David Bowman. In the real universe, AI has already played important roles in space exploration. We are still far behind HAL 9000. However, I am confident that it will play increasingly greater roles in future exploration missions. In this article I will overview the current status of AI in space exploration, as well as expectations for the future. In the last few years, we observed the emergence and rapid growth of the autonomous driving technologies here on Earth. On Mars, in fact, autonomous driving is a decade-old technology. An autonomous navigation and driving system called AutoNav has been behind the wheel of Spirit and Opportunity rovers, which landed on Mars in 2004. AutoNav is also on the latest rover, Curiosity. Driving on Mars is both easier and more difficult than on Earth. There is no rules of the road on Mars nor cops who would give you tickets. There are no pedestrians or traffics – very unfortunately, the Martian civilization, which we once firmly believed to exist since Giovanni Schiaparelli found “canals” on the red planet, turned out to be an illusion. This in turn means there are no paved roads on Mars, so a rover has to avoid rocks, dents, and dangerous sand dunes which would trap the rover. An AI “scientist” is also onboard the rovers. An algorithm called AEGIS is capable of autonomously identifying interesting rocks and terrain features. Why this is important? It is because the rover cannot send all the photos it takes during the drives back to the Earth, due to the limited communication capacity. By intelligently choosing the photo targets using AEGIS, we can avoid missing interesting things without significantly increasing the data volume. The history of AI in space exploration dates back to 1998. On board a comet probe Deep Space 1 was an AI algorithm called Remote Agent, which was co-created by my PhD advisor Brian Williams when he was at NASA Ames. Remote Agent demonstrated the capabilities of planning activities and diagnosing failures on-board. The offspring of Remote Agent are still used by many space missions, though mostly for ground operations instead of being on-board. You might think AI is already so advanced to the point of beating a human champion in Go that it will soon replace human astronauts and ground operators. Fortunately or unfortunately, it is not that easy. There are two reasons. First, the computers on space probes are very slow. For example, Curiosity’s brain is a CPU called RAD750, which is a variant of PowerPC 750, the CPU used for Macintosh computers in late 1990s. It is clocked at 200 MHz with just 256 MB of memory (RAM). Modern personal computers typically have a CPU clocked at 2-3 GHz and 4-16 GB of RAM. Yes, giga Hz and giga bytes, not mega. There is an order of magnitude difference between them. Furthermore, modern CPUs usually have multiple cores. Though it is not straightforward to quantitatively compare computation power, I think there is more than an order of magnitude difference. Why do space probes use such medieval computers? A main reason is radiation. If you bring your PC or Mac to space, radiation would soon screw it up. The development of a radiation-tolerant CPU needs some time and cost. Also, it has to go through extensive tests to validate that it has a required level of radiation tolerance. For these reasons, computers used in space are typically a few generations behind the ones in your laptop. The second reason is reliability. Of course, we are not worrying (at least for now) that AI rebels against humans as HAL 9000 did. However, AI can make mistakes. And we definitely do not want AI to crash a billion-dollar Mars rover just because it fails to identify a pitfall, even though the chance is very low. Therefore, even if AI is available, human operators prefer to fly spacecraft manually as much as possible and check everything by themselves. Spacecrafts are operated quite conservatively. For the same reason, any autonomy algorithms on spacecraft are designed very conservatively. When it detects any slightest anomaly, it stops a rover or bring a spacecraft into the safe mode immediately and wait for human’s instructions. In fact, the typical distance that AutoNav drives on Mars is merely ~10-20 meters per Sol, or a Martial day (which is about 24 hours 40 minutes.) Still, it means a lot because manual driving cannot go beyond the line-of-sight distance, which is ~100 meters at most. But the point here is that spacecraft is operated very carefully in order not to lose them, and any AI algorithms that go behind the wheel of spacecraft must meet a very high standard of reliability. Despite the challenges, I believe AI will, or has to, play vital roles in future space exploration. In the next Mars rover missions, the rovers will be required to drive a significantly increased distance on average. As I said, the manual driving is limited by the line-of-site distance, which means that the autonomous driving distance must be significantly extended in order to achieve the goal. One of my ongoing research is to increase the reliability of AutoNav. 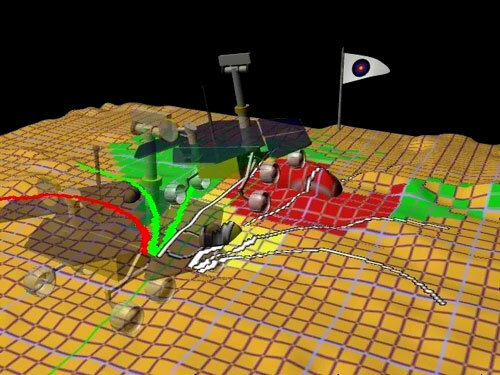 The goal of the research is to combine a machine learning-based terrain classifier and an advanced path planning algorithm, which would allow rovers to drive on complex terrain with reduced conservatism but without compromising in reliability. Unlike Mars surface, orbital reconnaissance of the subsurface world is almost impossible (I said almost because the Europa Clipper spacecraft will be able to “see” beneath the ice using the ice penetrating radar, although not to the detail as the surface of Mars). Communication to Earth is even more limited. The probe might be trapped in ice if it waits for the instruction of human operators. Without an advanced autonomy, exploration of such a remote world would be severely limited, if not impossible. I am also involved in a research of an advanced autonomy, dubbed as Resilient Spacecraft Executive (RSE). Remind the final scene of Terminator, where T-800 kept going after Sarah Connor even after its limbs were crippled. Well, please relax, we are not building a machine intelligence that would terminate humans, of course. We are creating a machine intelligence that can make flexible decisions in an uncertain situations, and continue the mission even under partial hardware failures by rapidly adapting to the changes. RSE is still in an early stage of development. It would take a long time to fly. As I said, due to the enormous cost of failure, space exploration is very risk averse and hence very slow to adopt new technologies. However, everyone would agree that technical innovations are necessary to boldly go where no man has gone before. We want to go to the subsurface ocean of Europa. We want to explore the cave systems of Moon and Mars. We want to sail the methane ocean of Titan. And someday we want to discover extraterrestrial life, which would completely change the view of not only the universe but also our own ecosystem. And I believe AI is a key enabler.